FRESNO – A local spring-time favorite, the Water-Wise Give and Take Plant Event, will be held at the Fresno State Horticulture Greenhouse Park at 3150 E. Barstow Ave on May 3, 2014 from 8 a.m. – 12 p.m. with a new kick-off event hosted by Friends of the Madden Library on Friday, May 2 at 6 p.m. Both events are free for the public and designed to educate guests on how to save water with Fresno-friendly landscaping practices. The event on Friday will include a panel discussion with Q & A on Smart Gardens: How to be Water-Wise in Times of Drought. Saturday’s Water-Wise Plant Give and Take Event will draw hundreds of guests, dozens of master gardeners, offer hands-on activities for kids, and provide free educational workshops. Guests are invited to experience and learn from all of the participating partners, while picking-up a limited amount of free, drought-resistant plants for their gardens. Gardeners will receive something special for donating water-wise plants, cuttings, bulbs, seeds and trees to share with other guests. Throughout the event, experts in native and water-wise plants will be on-hand to offer advice for nurturing yards and gardens that are not only beautiful but also can thrive in San Joaquin Valley weather with a minimal amount of water. · Workshops led by Master Gardeners on: “Creating a cactus / succulent dish garden”, “Composting”, “Topiaries”, “Micro-irrigation and Drip Systems”, “Growing Vegetables in a Drought” and an additional workshop led by the USDA on “Micro-irrigation and Drip Systems”. Landscape irrigation represents up to 70% of water used in a typical household and much of this water is wasted by inefficient irrigation and water-guzzling landscaping. By planting water-wise San Joaquin Valley-friendly trees and plants that use two-thirds less water than other plants, households can save water and money without sacrificing a beautiful landscape. In addition to water-wise planting practices, households can also save 15-25 gallons of water per day by adjusting sprinklers so they don’t water driveways, streets and sidewalks. To further educate the community on watering practices, the City of Fresno will have a water meter displayed at the event and will talk with residents about their own meters, or sign them up for free landscape consultations and water leak surveys. 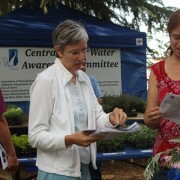 The Central Valley Friendly Landscape Award Program winners will also be at the Water-Wise Plant Event, showcasing their award-winning gardens and in honor of Cinco de Mayo, Fresno State-grown pepper plants will be available in exchange for a donation to benefit the Ag Student Scholarship fund.